A few weeks back I won a free bag of Custom Choice Cereal from FoodCents blog. I am not gluten intolerant but I do love trying new, healthy products. I told Custom Choice Cereal that I would do a product review fro them as I know I have several readers who are gluten free. 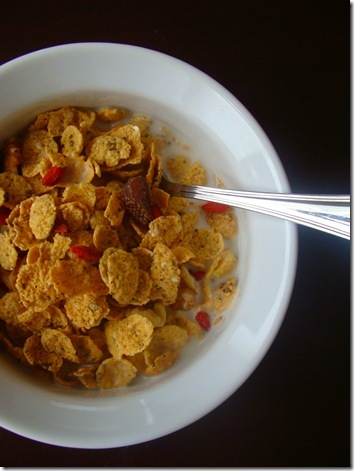 Custom Choice Cereal is an online gluten free cereal company. I know how hard it is to find quality gluten free products in the super markets as I have done my fair share of looking. The great concept about this company is you are able to choose your very own custom blend of cereal; make it as crazy as you like or keep it plain and simple! 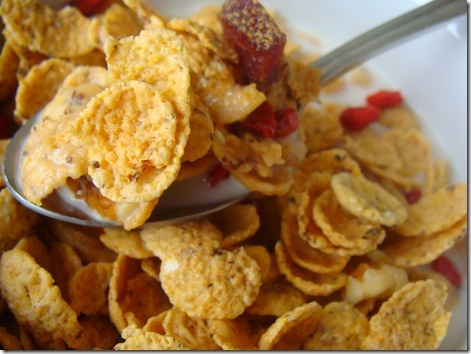 You start with your base: you can choose from Cinnamon Granola, Corn Flakes or Good Morning Flakes. Then you pick what dried fruit you want in your mixture. They have 11 kinds to choose from; apples, banana chips, pears, strawberries, goji berries, blueberries and so on. Next you can add nuts and seeds. Walnuts, coconut, pecans… 9 in total. And that’s it – your very own blend of gluten free cereal! How fun! Or if you are not in the mood to create your own they have pre-planned mixes to choose from or to get inspiration from. You are able to choose how ever many ingredients your heart desires. It keeps tallying up the price that is visible in the lower right hand corner, as well as adds up the nutrition info for you to view at all times. I was able to create my own mix: I chose the Good Morning Flakes, which has flax, buckwheat, quinoa and amaranth in them, dried strawberries, banana chips and goji berries for fruit and walnuts for my nuts. I sent my mix in over the weekend and it arrived only a few days later! I was so impressed by their shipping and customer service – 5 stars all around! The taste was phenomenal! 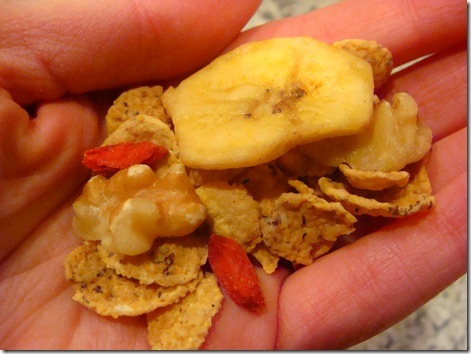 The flakes have a wonderful crunch and lightly sweetened taste and the nuts and fruit go wonderfully together! Not too overwhelming and every bite was a surprise! My package of cereal was 12 oz all together and would have cost $8.65 if I had to have paid. 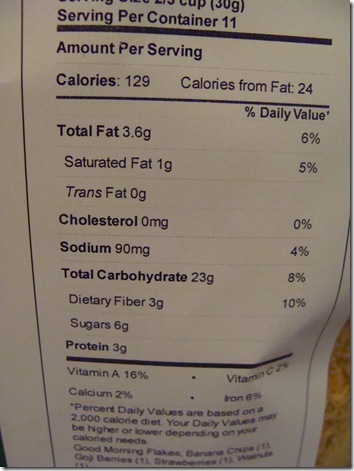 They also print the nutrition facts and stuck it on the back. Serving size is 2/3 of a cup. I have been munching on this cereal over the weekend and finally had a lovely bowl with almond milk this morning. So scrumptious! I really do love a great bowl of cereal! Who doesn’t?! If you are living a gluten free life I highly recommend this cereal. Even if you are not I STILL recommend it! To some it may be spendy but unfortunately there are not a lot of choices to choose from if you cannot have gluten – especially if you do not live near a health food store. Here is their entire About Us page stating their wonderful business model and why it is so important for gluten free individuals to have a company to ensure the safety and quality of gluten free food. And be sure to check out their blog as it contains recipes, reviews and updates. Have questions? Their FAQ page is loaded with wonderful answers, too. 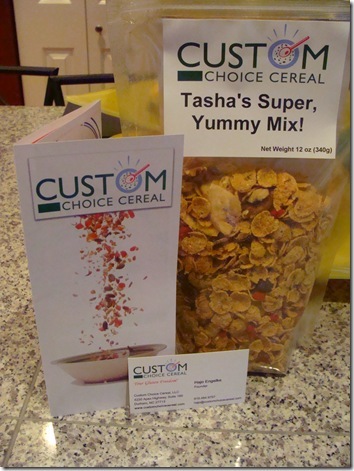 Wonderful product, Custom Choice Cereal! Keep up the amazing work! This entry was posted in gluten free, product review. Bookmark the permalink. What a fun idea! My H *looooves* cereal and needs the GF kinds. I might get him some as a b-day treat this year. Thanks, both my husband and I are gluten free and he is a total cereal junkie! I might get him some as a treat!